There are lots of video baby monitors available on the market these days, thus making it hard to buy the best one. What kind of monitor must you get, what features are vital, what price must you pay? These are the questions to think about. 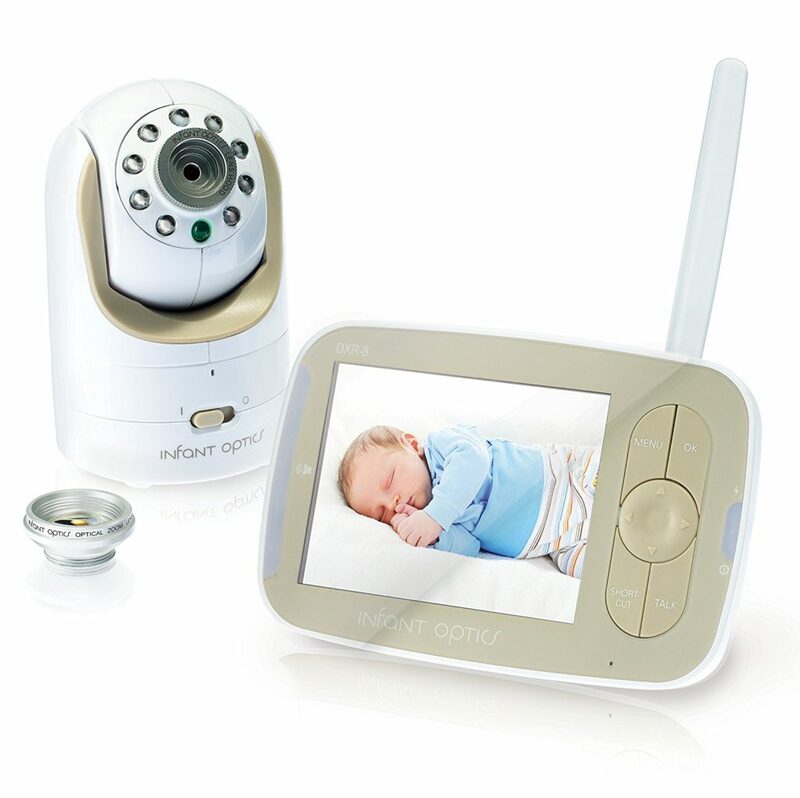 To help you pick the right video baby monitor, this article will be going to review one of the most reliable video baby monitor; Infant Optics DXR-8 Video Baby Monitor with Interchangeable Optical Lens. This video baby monitor is ideal for sleep training. As a mother, you may need to know whether your kid has got up or not. Sleep training requires that the little ones get a chance to go to sleep on its own without the parents’ intervention. This video baby monitor allows you to do just that. Parents wait for your baby to self-soothe before you go and help them fall asleep. This allows you to sleep tight, serve as a sleep tracking and improve security as well. This is arguably the best benefits of owning Optics DXR-8 Video Baby Monitor. The state of the art Infant Optics DXR-8 outperformed other video baby monitors available on the market. Its audio and video quality is superb. Installing this unit is easy and quick which is essential if you have lots of other things to tackle in preparation for a baby. This video baby monitor comes with interchangeable lens technology. The video is streamed in real-time to a thin 3.5 inches LCD color display offers clear image. It has a long-lasting battery; twelve hours in power saving mode, and eight hours with the LCD screen always on. No set up needed, and not like other products, and this video baby monitor secures a 2.4GHz FHSS wireless transmission that gives 100% digital privacy that has delay-free video and audio playback. With this unit, total vision control of the baby’s room is now a reality. The innovative lens system of the Infant Optics DXR-8 Video Baby Monitor allows you to modify the performance camera by switching different lenses on the camera in seconds. Pick the most appropriate focal length as well as viewing angle for a specific setting, just like an expert camera system. This is a good investment which grows with your loved ones. You can utilize the close-up lens for close vision, and change to a panoramic lens if your kid becomes mobile to give a full sight of your kid’s activity. During power saving mode, the clear screen switches off while the audio stays on. It reduces the consumption of the battery by half. It transforms this unit into an audio-only monitor. This unit has a row of LEDs which allows you to perceive the sound of kid’s voice alerting you if she or he is crying once you have the sound turned down. This is discrete, smooth and quiet. It remotely controls the direction of the camera. Remote in-room temp display allows you to know if your little one is safe and comfortable. • No other video baby monitor available comes close to Infant Optics DXR-8 Video Baby Monitor when it comes to video quality. The picture it projects is clear as well as smooth. If you set up this unit with monitor thirty feet away, the image remained clear and smooth with each movement, without trails and lag. Even though the screen is relatively small at, with the low resolution, it does not make much of dissimilarity in the quality of the video. • This unit provides you the capability to direct the camera from the monitor; therefore parent can pan the camera, tilt up and down, as well as zoom in to make out more detail without disturbing the baby. • Installing the DXR-8 was very easy. After charging unit overnight, you simply plugged in the camera and switched on the monitor, and this unit picked up the reception immediately. • You cannot record or take snapshots video using this video baby monitor. The state of the art Infant Optics DXR-8 is proven to be the most excellent video baby monitor available today when it comes to video and audio quality. It is user-friendly, regardless of the level of technical familiarity.